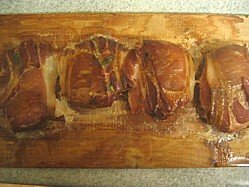 This smoked pheasant breast recipe is an absolute result using bacon and a pre-soaked cooking plank to keep everything fresh and juicy. My good friend and neighbor dropped a brace at my front door along with the words "I've just shot these, what are we going to do with them?" You might be thinking that rather than cooking freshly shot pheasant that they should be hung for a week to add flavor and tenderize the meat but for me that's a matter of opinion. I'm not too enthusiastic about strong flavor, I prefer my pheasant fresh and it's perfectly acceptable to eat it this way, it's personal choice. 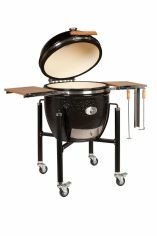 This recipe is takes about 2 hours to cook and you’ll need 4-8 hours brining so give yourself plenty of time. When reading about game meat you’ll probably find as I did that many folks warn about how dry the meat can be and this worried me a little so I took two precautions that really delivered the goods. The first was to wrap the pheasant breast in bacon so that the fat from the bacon acts as a baste. My second thought was to smoke it on a pre-soaked cooking plank but don’t worry if you haven’t got any planks, it’s the bacon that delivers the greatest impact. I also kicked this smoked pheasant breast recipe off with a weak brine (about 15%), nothing complicated, just salt and water. Read my article on brine concentrations to learn more. There are no allergens in this recipe. Dissolve the tablespoon of salt in a pint of water and stir until dissolved. Because it's such a weak brine the salt should easily dissolve, you can accelerate the process by warming the water but if you do, make sure that it has been properly chilled before dropping the pheasant breasts in the brine. Place the pheasant breasts in the brine for 4-6 hours. 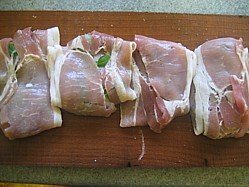 When ready to cook, place the pheasant breasts on the cooking plank, season well with black pepper (remember they’ve been in brine so you don’t need additional salt) place some basil leaves on top and then cover with the bacon taking care to “tuck” the bacon in under the breast to create a parcel as shown below. Set your smoker up at 110°C (225°F), cook for 2 hours and you’ll have the most fantastic smoked pheasant that you’ve ever tasted. To serve we didn't do anything fancy, just cut them into bite sized pieces and ate them. Had they lasted long enough to put them on a plate maybe I could have made a nice presentation out of them but they they were gone in seconds and everyone had a big smile on their face!